Did you know that there are only 5 airports where travelers from West Africa should enter into the United States? And that Detroit Metro Airport is not one of them? We did not. Oops! Here is our story on traveling from Liberia to the US and getting screened for Ebola. There is no Ebola in Liberia. I repeat, Liberia has been declared free of the Ebola virus. It has been over 80 days (almost 4 incubation cycles) since the last confirmed case. Life in Liberia has returned to normal for the most part, but people are still being vigilant. Entering into Liberia – When you land at at the Robertsfield International Airport (ROB) in Monrovia, Liberia you immediately notice large hand washing stations on either side of the entrance to immigration. Everyone lines up and rinses their hands and forearms in chlorinated water. Then, a women wielding two no-touch thermometers stands guard at the door and takes everyone’s temperature one by one. She takes the temperature of one person and lets anyone with a normal temperature pass. As the one thermometer cools, she immediately takes another temperature with the other. They read the temperature at your temples and ask you to remove your glasses if you ware wearing any. Life in Liberia – In Liberia, everyone is still washing their hands in chlorinated water. Almost every business has a bucket with a spigot filled with chlorinated water. If the business has a security guard, they will not let you enter until they visibly see you wash your hands. We encountered this at the apartment complex, the grocery store, the University of Liberia, and even the place where we bought phone credit. They are everywhere and people are happy to comply. At the apartment where we stayed, we had giant bottles of hand sanitizer that we used regularly and had our visitors use. We also brought no-touch thermometers but never needed to use them. Leaving Liberia – Personnel at the airport perform exit screenings of every single person trying to leave the country. When you arrive at the airport, they have you wash your hands in chlorinated water and fill out a health survey. It asks for your personal information, how you are feeling, and if you have been in contact with any sick people. After you complete the form, a nurse who wears gloves looks over your forms, confirms your identity with your passport, and takes your temperature using a no-touch thermometer. She writes your temperature in Celsius on a sticker and places it on your passport. You are required to wash your hands again and can then finally enter into the airport. Entry into and Departure from Ghana – Entry and Departure from Ghana followed the same simple procedure. Upon arrival, everyone has to pass through an infrared temperature screening station. There is a person sitting at a computer in the middle of the hallway with two processing lanes – one on either side. Each lane has a computer monitor with an infrared camera image. You stop at a line on the floor and look at the camera. If you are wearing glasses, you must take them off. The infrared camera looks at your heat signature and a button on the screen turns green when it decides that you are normal. The person waives you along and then examines the next person. The procedure is the same for trying to leave the country but the station is located after the check-in counters and before immigration and security. Entry into the United States is much more complicated than leaving Liberia and Ghana. We flew on Kenya Airways from Liberia to Ghana and then on KLM/Delta from Ghana to Amsterdam to Detroit. According to the Customs agents at DTW, KLM should never have allowed us on the flight in Ghana since our final destination was Detroit. We landed in Detroit around 3 PM on Friday, 26 June. We departed the plane with our things and went to the area where they have the customs / immigration agents and kiosks. American citizens can fill out information on the Kiosks and foreign visitors must do everything in person. Since Liz had declared cheese from Amsterdam, all three of us were in different immigration lines. Sahithya was the person to reach the customs agent. There were video screens posted around that asked for travelers who had been to Liberia, Guinea, or Sierra Leone to tell the agent. Sahithya had not noticed these signs and the customs agent never asked. She was approved for entry and headed to baggage claim. The next person was Sara. She had seen the signs and immediately told the customs agent that she had been in Liberia two days ago. The customs agent freaked out and immediately put on gloves and a mask. She went and told another agent who commented: “Well, my day has gotten significantly worse.” The customs agents then pulled Liz out of line and sent someone to find Sahithya. They gave us masks to wear and herded us to a back room where the worker from the Department of Public Health sits. Everyone working with us put on gloves and masks. We filled out forms about our travel and waited while someone called EMS to come and take our temperatures. The masks made it hot like in the winter when you have a scarf wrapped around your face. EMS arrived and took our temperatures with a TOUCH thermometer. He put it on one of our temples and dragged it across the forehead. We were all normal and even below temperature. The EMS worker was skeptical about the thermometer reading and repeated all of our temperatures, again using the TOUCH thermometer. We were then cleared to take off the masks, given Check and Report Ebola (CARE) kits, and continued into the United States. We were surprised at how people in the US reacted to Ebola. While we were in Liberia, we learned that face masks don’t have an effect on containing Ebola. The disease is spread by direct contact of bodily fluids (such as sweat, vomit, or blood) of a visibly ill person. We heard about examples of this when we talked to one person in Liberia, who said, “Every single person I know who had Ebola knows exactly how they got it. I know of no cases of anyone who got it by riding in a taxi or using public facilities. It was by direct contact with a visibly ill person.” For this same reason, touch thermometers should be avoided when checking for Ebola. Fortunately, Ebola is cleared in Liberia, and we are all healthy and safe in the United States. Ebola is a real and a serious disease. It has ravaged Liberia, Guinea, and Sierra Leone. Thousands of people have died and those three countries will never forget this crisis. Just like the US remembers the Spanish Influenza Pandemic of 1918, it is forever in their history. We hope that the rest of the world does not forget this crisis either and spends more time researching vaccines for diseases that are not “profitable” and affect the disadvantaged. Diseases like Ebola need to be better understood and health systems in the poorer areas of the world need to be significantly expanded. 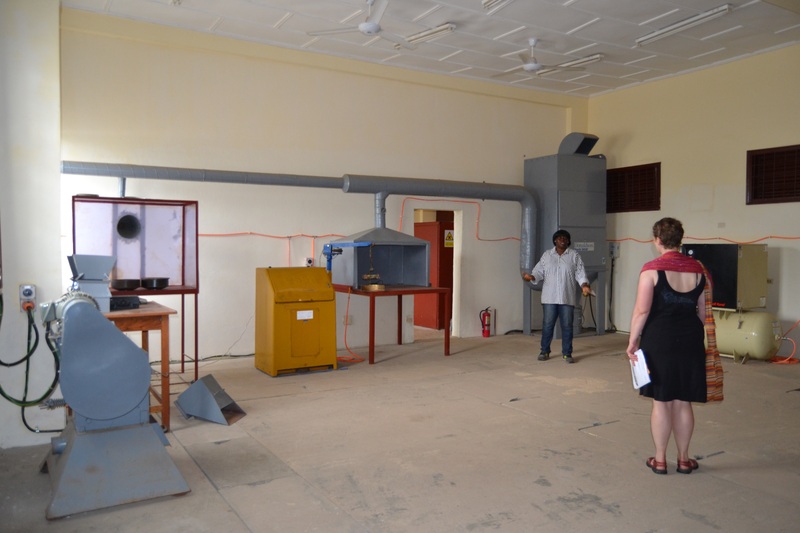 One of biggest revelations this week was that there exists a Society of Women Engineers of Liberia (SWEL). They are a registered Liberian non-profit organization and operate as a subset of the Engineering Society of Liberia. 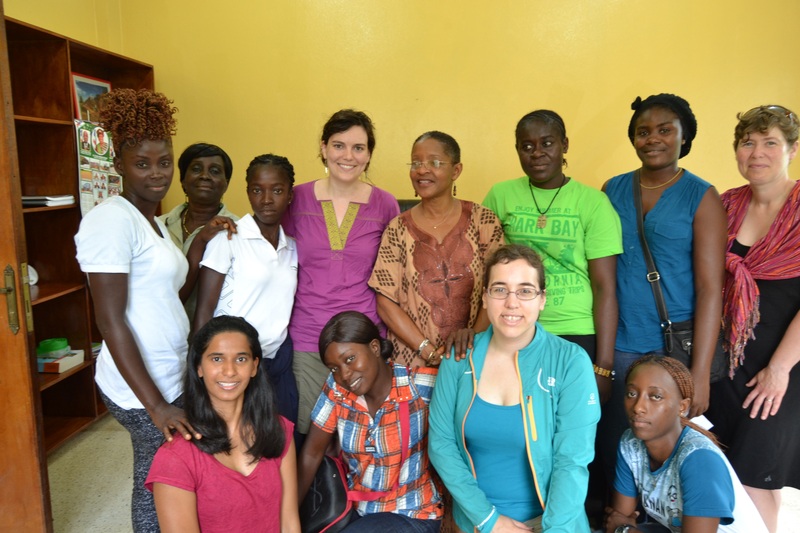 Established in 2013, they are dedicated to supporting women in engineering in Liberia and have collegiate members from vocational schools and universities, and professionals. We learned about their organization from both a Stella Maris Polytechnic student and a University of Liberia faculty member. To our suprise and excitement, they arranged a cook-out for us and the L-SWE women to meet them on Satuday. This was their first major event since the Ebola Crisis. We were thrilled to meet them. It turns out that although SWEL and L-SWE both started in 2013, neither knew about the existence of the other. So, on Saturday, we loaded up our van with us and 10 L-SWE women and drove to the cook-out. It was held at Tabitha’s Renaissance, Enginering & Design off of Roberts International Airport Highway. The SWEL women welcomed us with open arms. The food was great too. We had Liberian rice, pepper sauce, fried chicken, fried beef, grilled fish, fish sandwiches, and fried plantains. Super delicious! They even served South African cider, Savanna, and other beverages. Not knowing that there would be so much food, we brought juice and cookies to share. The women of SWEL are incredible. They are passionate about helping Liberia move forward. Many of these women were from Liberia, left to pursue higher education abroad (China, Ghana, Australia, etc. ), but came back to improve Liberia. They are superb role models for the women of L-SWE and Liberia. The SWEL organization is growing and is looking to become a voice on the international stage. We look forward to helping them get connected with the larger Society of Women Engineers organization. 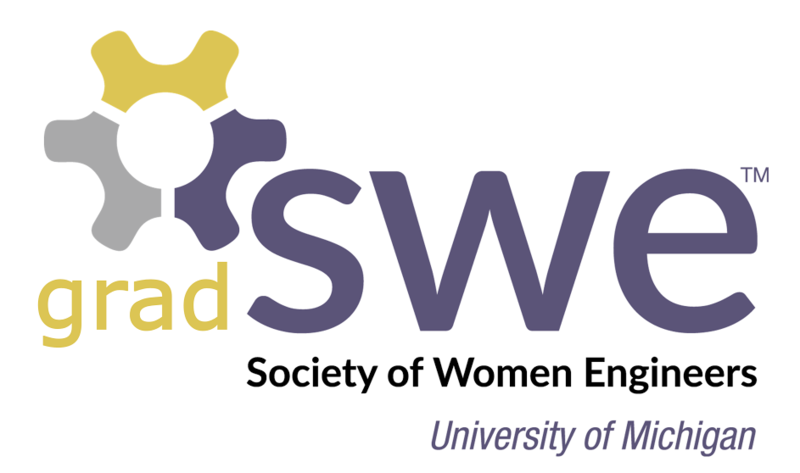 We invited the women of SWEL to our networking dinner tonight and cannot wait to get know them more. After 18+ hours of travel, we have finally made it to Ghana. Tomorrow we will depart for Liberia. Since this is my first trip overseas, I want to take a moment and reflect on it and give a quick update before we leave. The internet in our hotel is great right now. This was my first time flying over the Atlantic Ocean. Although I slept most of the way, it was an awesome view. Early in the morning we caught the sun rising over the ocean. It was incredible! I also really enjoyed the in-plane food and beverage service. Did you know that you actually get complementary dinner and beer/wine when you travel overseas on Delta? Even in Economy! I was pleasantly surprised. It was delicous too. They even served complementary beverages like tea, wine, beer, coffee, and juice. The next leg was from Amsterdam to Ghana. The Amsterdam airport was complicated but we made it to our gate with plenty of time. KLM provided excellent service and even better food than Delta. It was my first plan ride where English was not the default announcement language. It was third after Dutch and French. The views of the Sahara desert were awesome too. Also, did you know that Diet Coke is called Coke Light in Holland? After our long flight, we finally made it to Ghana. The Ghana airport is nice enough but customs took over 2 hours. It turns out that Ghanaian visas are a bit complicated. The hotel shuttle left without us because we took so long, but we just caught a taxi instead. We all feel bad about having the shuttle driver wait 2 hours for us and never seeing us. The hotel is clean and we get breakfast in the morning. We leave for Liberia at 12:30 pm on Wednesday. Hopefully the airport is easier this time through. Overall, it has been a great day of firsts! First time flying over the ocean, first time in Europe, first time in Africa, first time hearing Dutch in person. I cannot wait to see what other firsts we encounter on this trip. We will post about our activities in Liberia soon. Thanks for reading!